Making the origami Fortune Teller toy is a great little activity for kids, because after they've made it... they can play with it! These instructions also have suggestions for the fortunes you can put inside the fortune teller. For a printable pdf version of the origami fortune teller instructions, click here. You will need Adobe Reader installed on your computer in order to open the .pdf file. You can get Adobe Reader here. 1. Start with white side up. Fold diagonally in both directions. 2. Fold each corner into the centre point. 3. Turn over and again fold each corner into the centre point. 4. Fold in half along creases shown, both ways, and open. 5. 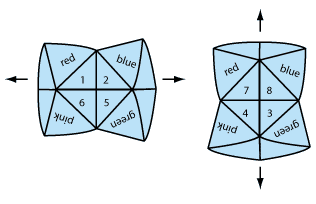 Number each segment from 1-8. 6. Open up each flap and write a fortune in each segment. Below are some examples of fortunes you can write, but you can also make up your own. You will get an "A" on a test. You will have very good luck today. You will have many friends. Do a good deed today. Someone will call you today. You will go to a party soon. 7. Turn the model over and write a colour on each flap as shown. Finished Fortune Teller. Use your fingers to open it up. The fortune teller in action. Move your fingers together one way and then the next. Now get the person to choose one of the numbers that are shown in the centre of the fortune teller when you finish spelling out the colour. Let's say it is 3. You would move the fortune teller 3 times. Then the person should choose a number from the ones showing this time. Whichever number they choose, lift up the flat and that is their fortune. 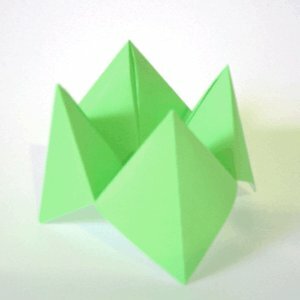 Have you made the origami fortune teller and want to make more?